Carefree blonde hair tucked under a Stetson hat, an old guitar and an easy grin are the key elements for singer/songwriter Bret Mullins. 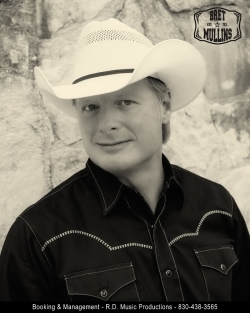 This 6’3” country artist is the very epitome one might expect of Texas Country Music. David Ryan, host of podcast, “Southbound I-35” nailed it when he described Bret’s sound as “a very distinctive voice but with certain familiarity.” Bret currently has two CD’s and receives lots of radio airplay with great reviews. He has an uncanny way of drawing his listener into his music, which attributes to his steady rise in popularity and crowded dancehall concerts. This 2014 winner of “Best Country Band of the Year” by the San Antonio Music Awards, along with his veteran band is shaking it up on the country music scene with performances not to be missed. With the ability to deliver what his crowd likes, Bret keeps them on the dance floor or the edge of their seat his entire performance…in other words…DYNAMIC!